When B.C. Burgess wrote his monumental book “The Living Cowries” in 1970 little was known about the South African endemic cowries. In fact according to Burgess there existed no live collected specimens of either Cypraea fuscorobra or Cypraea edentula. In the years that have passed, SCUBA has become much more prevalent and live specimens of all the South Africans are available. Still they are anything but plentiful on the market. At the Cape of Good Hope the Atlantic and the Indian Oceans converge. All the major mollusc families have members indigenous to the area. Cypraea fuscorobra and Cypraea edentula are members of the genus Cypraeaovula, Gray 1824. Both belong to the “algoensis” group. Cypraeaovula are noted for ecological variations and hybridization. Some are quite difficult to identify, even with a guide book. Cypraea edentula, Gray 1825 lacks teeth and is called, as to be expected, the Toothless Cowrie. It is commonly between 18 and 24 millimeters in size. Small specimens are more available than large ones. 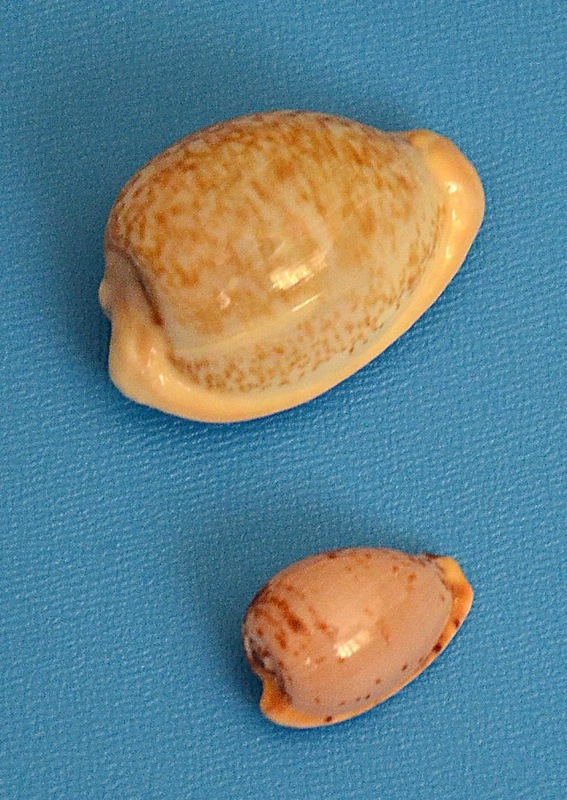 Cypraea fuscorobra, Shaw 1909, has the boring common name of “Reddish Brown Cowrie.” It is rather globular in shape with a large callous and larger in size, the average being between 30-36 millimeters. Both retail in the $15 to $25 range. Choice specimens, especially of Cypraea edentula are hard to find. Both are prone to stress marks across the dorsums. Our two specimens both collected this year are donated by Richard Kent. They were acquired direct from a South African dealer, are of superior quality and fine starters for a South African collection. Many of the closely related and similar looking species are considerably more expensive and very difficult to acquire without a direct South African source.